Today’s guest is not only a badass human being, but she’s also a sought-after medium to some of Hollywood’s A-List elite. She’s extremely gifted at not only connecting with spirit and delivering sacred messages, but also holding space for those in the experience. Her skills and talents have been used in a wide variety of forums, including bringing clarity to police investigations, and now she’s showing others how to tap into their gifts and live their fullest, truest lives. In short, she’s a badass! 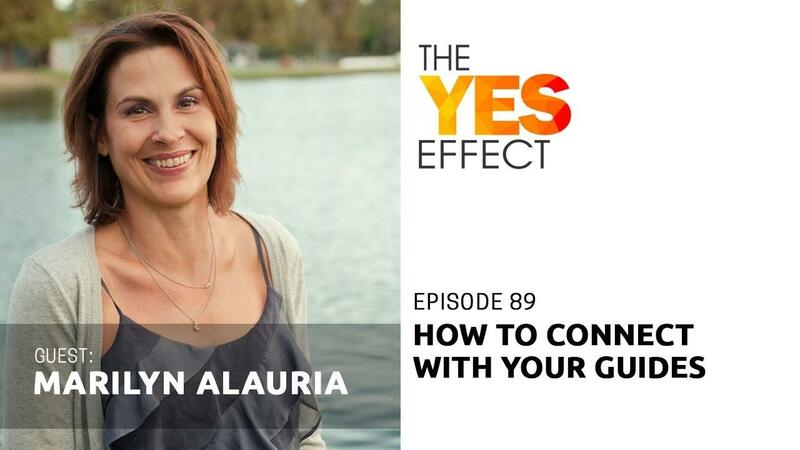 Her name is Mariyn Alauria, and this is The YES Effect Show! Internationally-renowned psychic medium, teacher, and coach, Marilyn Alauria, offers profound and powerful insights to clients around the world. Marilyn knows that it’s possible to be a spiritual person who lives a practical, meaningful, and joyous life—no unicorns, flying carpets, or impossible routines required. Helping others create that type of life for themselves is her passion. Engaging her gifts of vision, hearing, knowing, and feeling, she does more than just provide a connection to the future or the afterlife. Marilyn gives her clients an action plan and shows them how to anchor into their true purpose. A dedicated healer and instructor, Marilyn also teaches people across the globe to develop their talents, allowing access to the answers that sit in the seat of their souls. After a successful, Emmy Award-winning career in the entertainment industry, where she served on the MTV Networks Special Production Management Team and acted as the Senior Profiles Manager at the NBC Olympics, Marilyn turned her focus toward honing her innate gifts. Through an extraordinary journey of self-discovery, she learned to harness and embrace her abilities to help clients completely transform their lives. Certified in many modalities, Marilyn Alauria provides messages from the guides that are always with us and from loved ones who have crossed over. A regular guest on telesummits in the human potential and personal growth movement, she has reached thousands of individuals worldwide, facilitating the internal guidance needed to succeed, thrive, and prosper. When she’s not consulting with clients in groups and one-on-one sessions, Marilyn explores the world through yoga, tennis, hiking, and running. Integrity is the cornerstone of her work, and Marilyn’s priority is to see her clients embrace the happiness they are genuinely entitled to experience. As a psychic medium, healer, teacher, author, and speaker, she is devoted to using her abilities to bring awareness and enlightenment to every life she touches.